I wanted to write today about one of my favourite lipsticks in my collection, Bloom's Liquid Lipstick in 'Blossom'. I won this lipstick as part of a competition prize from the lovely blogger Aimie from Aimie Victoria's Secrets. If you've never visited Aimie's blog head on over and check it out, it's a great read. 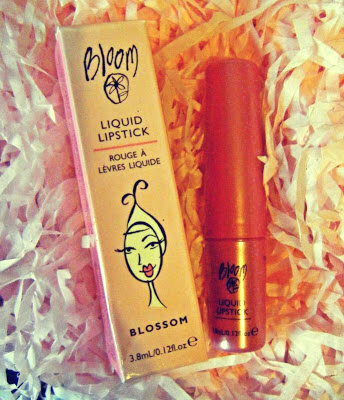 I must admit I had never heard of Bloom cosmetics before winning this prize but since researching about the brand and having had a look at their website - Bloom Cosmetics I found out that they've been around since 1993, oops! I've come to the conclusion that they aren't that big in Ireland as Bloom is an Australian brand, in fact I don't even know if they have stockists in my city but I do know that they have a counter in the Arnotts store in Dublin in case any Irish ladies want to go and check them out. From searching the Bloom website I can't find the lipstick which Aimie sent me but I did find some other lipsticks in some gorgeous shades. I especially love their selection of pink hues. The lipsticks Bloom sell all seem to retail in the region of $28 AU. Anyway, moving onto my liquid lipstick. Usually I'm not a fan of these types of lipsticks as the glossy effect they have is no good for a girl who lives in windy Ireland and who likes to wear her hair down all the time, the wind just seems to blow my hair directly onto my lips and then I end up with a glossy mess - not an attractive look! This lipstick however, even though it has the glossy, shimmer effect is not overly sticky and does not attract the wind so much as normal glosses do, this is a big plus in my book! The shade 'Blossom' is a gorgeous, rosy pink colour which looks quite natural on the lips. I personally love pink lip colours so this is a big favourite of mine, I find it so feminine and easy to wear. 'Blossom' is one of those universal hues that can be worn no matter what the season. I also love that this lipstick gives a 'plumping' effect to the lip without any strange tingly feelings having to happen first, such as with another of my favourite lip products Too Faced 'Extreme Lip Injection Duo'. I was surprised with how luscious my lips looked after applying the product. I love the twist effect element this lipstick has as you twist to release the amount of product you want, that way nothing gets wasted and you don't accidentally put the cap back on your lipstick and chip the top, something I have been known to do! The applicator is a foam pad which is soft on the lips and glides the lipstick on effortlessly. I have been wearing this lipstick now for the past five days and am not yet bored with the shade, I just love it! If anyone manages to get their hands on this product I would highly recommend it. I can safely say that this has now made its way into my everyday makeup bag and shall be staying there until the product is all gone.